Orchid names and taxonomy have this way of changing and have certainly moved on since my favourite flower book, Mediterranean Wild Flowers by Marjorie Blamey and Christopher Grey-Wilson, was published. If you are visiting Spain and Portugal, you may find the notes on the following species helpful. This isn’t a complete guide by any means but concentrates on orchids that are only or mostly on the Iberian peninsula and are quite likely to be found on our holidays. It would be fair to say that orchid buffs study them carefully and are keen on ‘splitting’ – defining new species. If you are a ‘lumper’ rather than a splitter or just like to enjoy them, that’s OK, of course. The convention for names is to follow Delforge (see right) – arguably he’s pitching the tents of the splitters’ camp. This showy species is common at Finca Santa Marta, our Extremadura holiday base. I was calling it milky orchid Orchis lactea as recently as 2007. My excuse is that Blamey doesn’t have this species and even the excellent Crossbill guide to Extremadura lists Orchis lactea rather than Orchis conica. Delforge says that Orchis conica probably replaces Orchis lactea in the Iberian peninsula. Another similar and closely related species is toothed orchid Orchis tridentata. It is quite conical, wouldn’t you say? 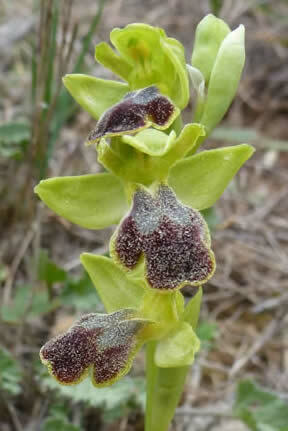 Find this orchid in Extremadura and, with luck, holidays in Central Portugal, La Mancha and Valencia. You may sometimes see names written such as Orchis (mascula) olbiensis. This may indicate that it’s an uncertain split from Orchis mascula – early purple orchid – but we sometimes also use this way of listing a species just to show what it’s closely related to – and therefore looks rather like. Orchis olbiensis (or sometimes Androrchis olbiensis – see photos in right hand column – tends to flower earlier than O. mascula, and have fewer & paler flowers. Immediate right, for comparison: early purple orchid Orchis mascula, Portugal, April 2012 (Rob May). Find this orchid in Valencia, Central Portugal, La Mancha and Algarve (references here to Algarve are to a spring holiday, not the now more usual autumn holiday). Blamey calls this Ophrys speculum subsp lusitanica and you can see it’s a little like a mirror orchid Ophrys speculum but much thinner and elongated, reminiscent of a fly orchid Ophrys insectifera. Find this orchid in Algarve and Central Portugal. Blamey calls this Orchis morio subsp champagneuxii; look carefully and you can see the green veins found in Orchis morio, the green-winged or green-veined orchid. It’s another showy species we see at Finca Santa Marta in Extremadura. The name is nothing to do with colour, fizz, or the Champagne region, even though it does occur in southern France: it’s named after a French botanist M. A B Champagneux. The lip is folded along the middle, so it can look narrower than green-winged orchid from the front, and the spur is thickened at the tip. Find this orchid in Extremadura, Central Portugal and Valencia. Also known as Ophrys dianica. Lucentina means from Alicante, Lucentum of the Romans. Some class this as a sub-species of Ophrys fusca, sombre bee orchid, though the yellow edge to the lip makes it look a little like Ophrys lutea, yellow bee orchid. Photographed in Valencia, February 2016. This helleborine (photo, right) was a new one on me in Algarve in April 2009. Delforge puts this in a group with Epipactis tremolsii, which isn't in Blamey & Grey-Wilson's book either, but at least the name lusitanica shows that it's to be expected in Portugal. Its rather small leaves are a distinctive feature. Chris Durdin, April 2009, with later additions and updates. There are many books on orchids but this is the book: Orchids of Europe, North Africa and the Middle East by Pierre Delforge (A&C Black) (click here for more info). There are also valuable regional orchid guides, including one in Extremadura. If you like orchids, have a look at our Dordogne orchid gallery and our Crete orchid gallery. La Mancha flora: includes Orchis cazorlensis. Valencia orchids: see list and photos on our 2018 report here. PDF of a guide to orchids in Extremadura here. Extremadura Project Orchid website in Spanish here. More on Spanish orchids, from John Muddeman, here. Best website for flowers of Spain: Flora silvestre del Mediterráneo.